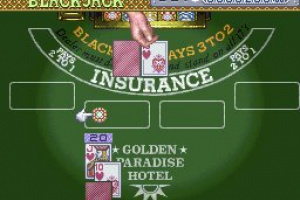 Jackpot winner or total craps? 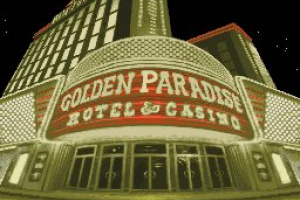 Experience all the thrills and skills of real casino action, as you take a trip to the ultimate gambler's paradise: Las Vegas! 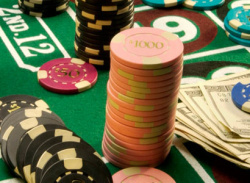 Check into a luxurious hotel, hang out with your friends and chat to other punters, before placing your bets at authentic recreations of Blackjack, Slots, Roulette, Craps and Seven Card Stud. 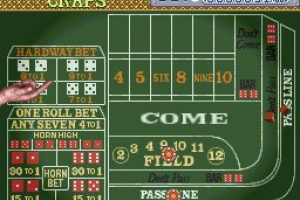 For solo players, a computerised companion explains the rules and offers advice, easing beginners into the action. In multiplayer mode, compete with up to three friends for the $10 million prize! 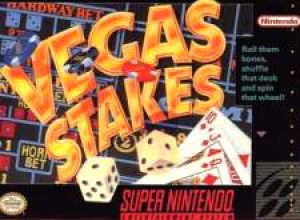 Vegas Stakes was a pretty good casino sim for the SNES... I loved it at the time. It may not completely be the best out there, but it did the job very well. I look forward to the possiblity that this game will be released. 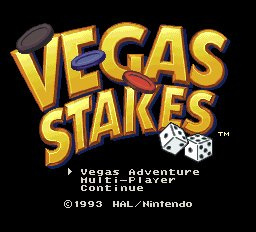 It's okayish, but I already own a gambling game (Caesar's World), and it's not exactly the kind of genre you need a lot of titles in. 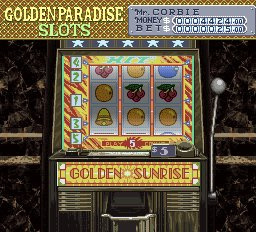 Hm, aren't gambling games automatically rated M nowadays? Will this be the first "omgmature" VC game? Sweet! 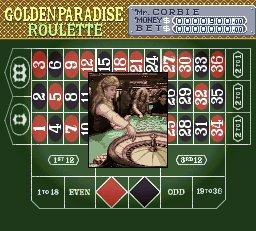 Of all the casino compilation games I've ever played, this is by far the best. 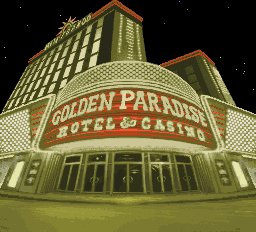 I'd love to see a sequel to this, but in the mean time I'll settle for this on VC. The game looks alright, I'm not really tempted though. I'll just stick to 42 all time classics. 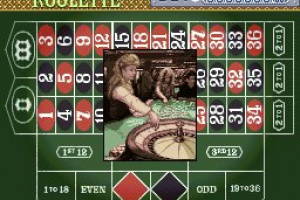 Obviously, if you're not into games that rely completely on luck you will hate this game. It's ok, not worth the download if you ask me, this is probably my worst download to date. Play cards in real life, it's a lot better. I hope this comes out in the US. I remember playing this a lot as a rental-couldn't get enough of it. Way better than Super Caesar's Palace. There's a funny TAS video on Youtube of someone winning this game in a few minutes using savestates. If only that worked in real life. This was fun on the original game boy, but I won't be buying it for VC. 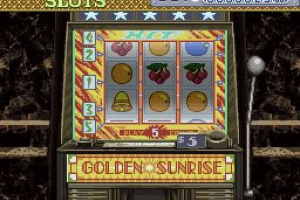 As one mentioned, there are several casino simulators for free on the web now; this just doesn't seem that exciting. Nice! 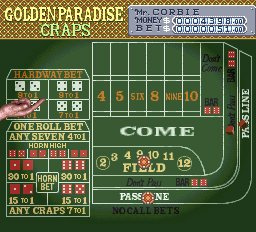 This is the only gambling sim i ever really liked. The little added bits with other random characters walking by made this more interesting than any generic sim. I've been waiting for a sequel to this. I didn't know this was a sequel to Vegas Dream, my favorite gambling game on the NES. I noticed the similarities with the interaction between random strangers and your character, but didn't think much of it. Good game. umm, no fun unless you win money. 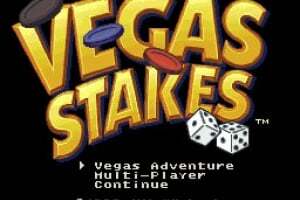 Did anybody else notice that this is currently the only VC game without a video on this site? Kinda strange.. 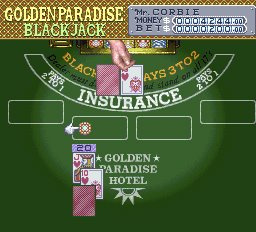 It was fun playing it long enough until you could break the bank.